Get Ready - the Independence Celebration with Fireworks is Next Monday! It’s almost that time again – the annual Independence Celebration fireworks show over the Astoria Park waterfront! 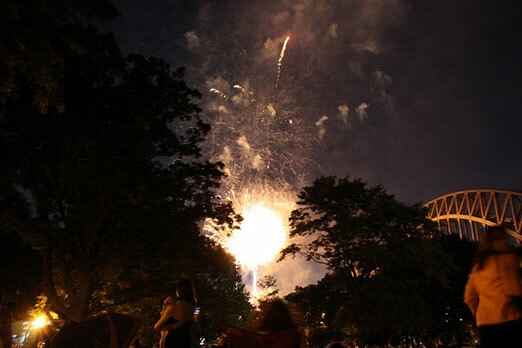 With the (in our opinion) faulty decision to hold the Macy’s Independence Day fireworks display over the Hudson River yet again, taking advantage of the Astoria Park celebration is a great way to satisfy your pyrotechnic-viewing needs this summer. The Independence Celebration will take place on Monday, June 24th at 7:30pm on the Astoria Park Lawn (Shore Blvd. between Hell Gate Bridge and the Pool). The Queens Symphony Orchestra will play some tunes and then we’ll get to see a spectacular Grucci Fireworks display after dark. The whole thing is organized by the Central Astoria LDC and is FREE! So, bring a blanket, some food, and friends/family for a terrific evening outside in Astoria. Correction: The Macy firework is going to be on the East River this year. This post is from last year, when the Macy’s fireworks were on the Hudson River.